So your little one decided to arrive a bit early... there’s nothing to worry about. You just need to be patient and take it one day at a time. Most importantly, you both need sleep. As all preemies require a little extra care, you need to be really selective when it comes to choosing the perfect bassinet for your little one. We’ve rounded up the Top 3 best bassinets for preemies. Let’s check them out! Chicco is a renowned Italian brand of baby products that’s been around for many decades. This company never fails to deliver well-designed products that can make new parents’ lives much easier. It’s a bit of a no-brainer for us to include a Chico bassinet here. You have a choice of three beautiful colors – Lavender, Chestnut or Grey Mist. They are sure to fit any modern interior with subtle pastel overtones with a sleek frame. The sleek bassinet is ideal for parents who want to travel or pay frequent visits to family and friends. It can quickly be unfolded and folded up again. The top, sturdy structure comes in one piece that easily connects to the snap-on legs. Once folded, it fits into the supplied carrying bag. The most important thing about this cozy bassinet is that its windows are made of mesh and the mattress pad is brushed. Your baby will be quite comfortable with it. Another subtle touch is that the legs feature anti-slip feet so the bassinet can’t slide all over the floor. It is lightweight and portable too. Cleaning and maintenance are easy. All the fabric pieces can be washed in the washing machine. Up to 20 lbs weight. In contrast, some people have addressed issues with the mattress over time. The Soothe & Sleep Lila Bassinet is obviously meant for little baby girls. It may be too pink for a baby boy. Of course, this isn’t a bad thing – it’s just the only color option on offer. This one is equipped with a wide variety of sounds, melodies, and soothing vibration to help your little one fall asleep much quicker. This is the least expensive product on our list here but don’t let that scare you off. It is one of the best bassinets for preemies that we’ve seen so far and not just because it offers quite a lot for the asking price. The first thing you’ll notice is the pretty design with soft pink colors and embroidered flowers on the sides and adjustable canopy. It is very lightweight so you can carry it around rather quickly. It also has little wheels with locks so you can move it around your home and secure it into position. The extra large storage basket easily snaps onto the frame, and it can carry quite a lot of miscellaneous stuff. 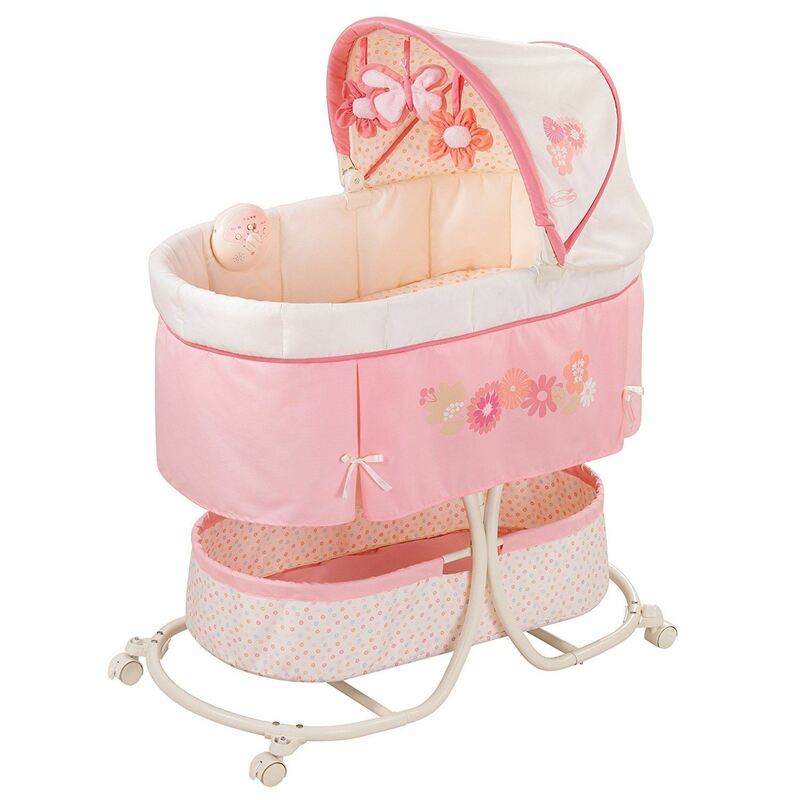 A central feature of this bassinet is the ability to produce a vast array of different soothing sounds, melodies and even vibrations which can help your baby to fall asleep much easier. The audio requires 3 AA batteries to operate. You can also set the timer to switch off the sound to extend battery life. 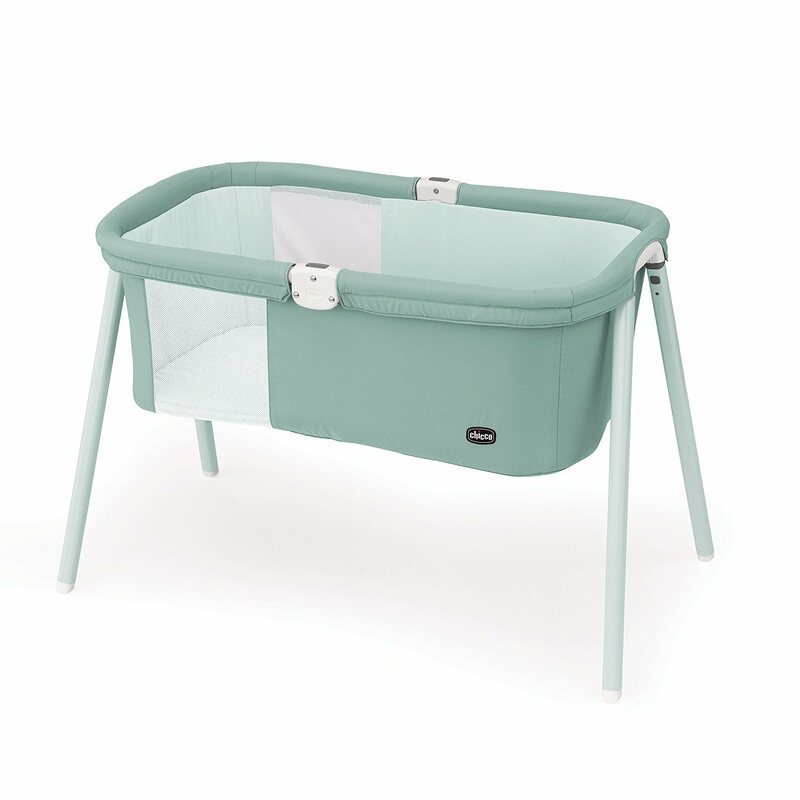 The top of the bassinet has a canopy which folds down easily while on the inside has a padded mattress with removable mattress sheet for your little one’s ultimate sleeping comfort. Proudly sporting a Gold Award from the Mom’s Choice Awards, this bassinet company has been awarded for its products for over 20 years while continually improving its designs to stay current with everyday needs for your newborn. All the accomplishments come with a matching price tag as you might expect. 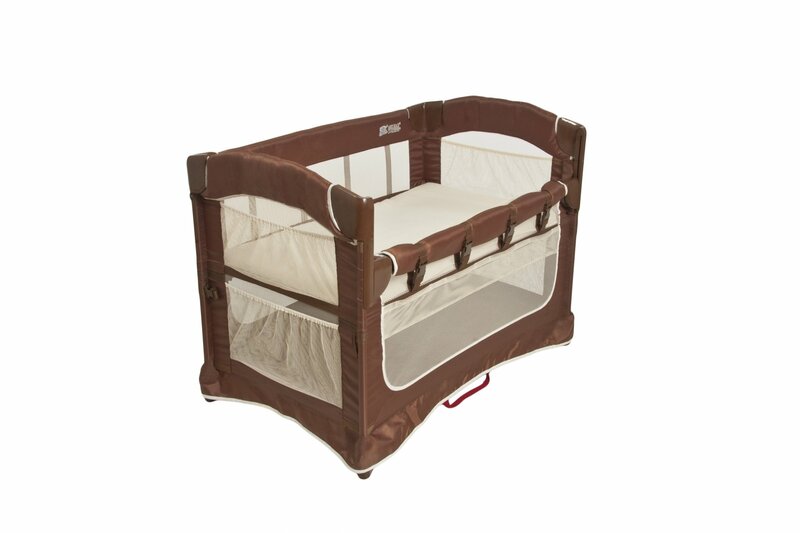 It is also convertible from a bedside sleeper to a free-standing bassinet into a play yard. We’re talking portability and ease of assembly, it’s really a no-brainer. Excellent and simple design makes for a really great product. You can also choose from natural or cocoa brown finish. Both colors look very stylish and will fit any interior space rather nicely. This design doesn’t feature a carrying bag. It is a sturdy bassinet that is not made for travel but the includes side pockets which can be used for storage. Inside the bassinet, you will find a very comfortable padded mattress. The 4” sleeping nest with the mattress is a rather cozy place for your preemie. There is also an attachment strap that will keep your baby safe at all times. All things considered, you can’t go wrong with any of the products featured on our list of best bassinets for preemies. When you think of the fact that your preemie will soon grow too big for a bassinet, you may want a product that will give you the most value for your money, rather than break the bank. Make sure to check weight capacity when buying your premie bassinet. With that in mind, we strongly suggest the Chicco LullaGo bassinet as it is comfortable, portable, well-designed and relatively affordable.